250 mg of activated medicinal charcoal obtained by carbonization of coconut shell. Activated (medicinal) charcoal is a capable of absorbing a great number of substances of organ and unorgan origin, as well as gasses. The adsorption of a large number of food ingredients, as well as contaminants in nutrition and drinking water, the active components of many medicaments, the products of bacterial metabolism, etc. is enabled by a large specific surface area of the activated charcoal particles. Activated charcoal isn´t absorbed from the gastrointestinal tract and is not subjected to metabolic degradation. As an integral part of the household pharmacies it is desirable to have with you on a trip, vacation and excursions. The beneficial effect shows with nonspecific diarrhea and excessive flatulence after eating. 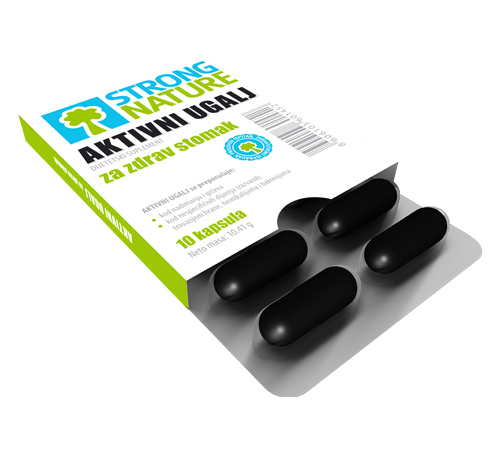 STRONG NATURE ACTIVATED CHARCOAL is intended as a dietary supplement with favorable effect on digestion regulation and organism detoxification. If necessary, take 2-3 capsules, three to four times a day.